Earth’s atmosphere contains about 20% molecular oxygen, O2, a chemically reactive gas that plays an essential role in the metabolism of aerobic organisms and in many environmental processes that shape the world. The term oxidation was originally used to describe chemical reactions involving O2, but its meaning has evolved to refer to a broad and important reaction class known asoxidation-reduction (redox) reactions. A few examples of such reactions will be used to develop a clear picture of this classification. In this reaction, then, sodium is oxidized and chlorine undergoes reduction. Viewed from a more active perspective, sodium functions as a reducing agent (reductant), since it provides electrons to (or reduces) chlorine. Likewise, chlorine functions as an oxidizing agent (oxidant), as it effectively removes electrons from (oxidizes) sodium. The product of this reaction is a covalent compound, so transfer of electrons in the explicit sense is not involved. To clarify the similarity of this reaction to the previous one and permit an unambiguous definition of redox reactions, a property called oxidation number has been defined. The oxidation number (or oxidation state) of an element in a compound is the charge its atoms would possess if the compound was ionic. The following guidelines are used to assign oxidation numbers to each element in a molecule or ion. The oxidation number of an atom in an elemental substance is zero. The oxidation number of a monatomic ion is equal to the ion’s charge. The sum of oxidation numbers for all atoms in a molecule or polyatomic ion equals the charge on the molecule or ion. 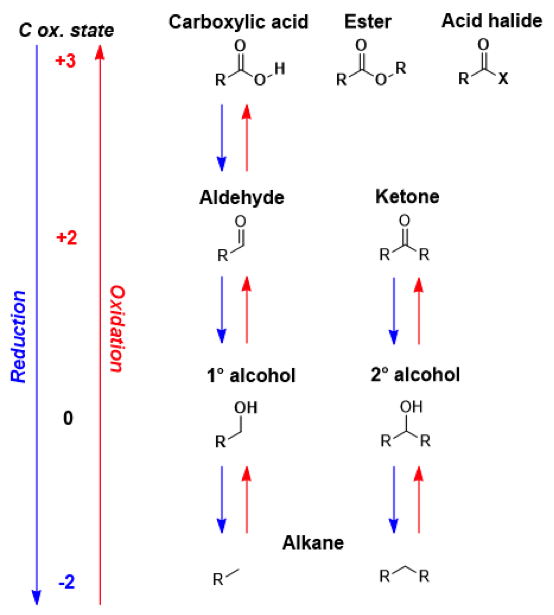 Returning to the reactions used to introduce this topic, they may now both be identified as redox processes. In the reaction between sodium and chlorine to yield sodium chloride, sodium is oxidized (its oxidation number increases from 0 in Na to +1 in NaCl) and chlorine is reduced (its oxidation number decreases from 0 in Cl2 to −1 in NaCl). In the reaction between molecular hydrogen and chlorine, hydrogen is oxidized (its oxidation number increases from 0 in H2 to +1 in HCl) and chlorine is reduced (its oxidation number decreases from 0 in Cl2 to −1 in HCl). When methane is oxidized to carbon dioxide its oxidation number changes from -4 to +4. Classical reductions include alkene reduction toalkanes and classical oxidations include oxidation of alcohols to aldehydes. In oxidations electrons are removed and the electron density of a molecule is reduced. In reductions electron density increases when electrons are added to the molecule. This terminology is always centered on the organic compound. For example, it is usual to refer to the reduction of a ketone by lithium aluminium hydride, but not to the oxidation of lithium aluminium hydride by a ketone. Many oxidations involve removal of hydrogen atoms from the organic molecule, and the reverse reduction adds hydrogens to an organic molecule. Many reactions classified as reductions also appear in other classes. For instance conversion of the ketone to an alcohol by lithium aluminium hydride can be considered a reduction but the hydride is also a good nucleophile in nucleophilic substitution. Many redox reactions in organic chemistry have coupling reaction reaction mechanism involving free radical intermediates. True organic redox chemistry can be found in electrochemical organic synthesis or electrosynthesis. Examples of organic reactions that can take place in an electrochemical cell are theKolbe electrolysis. In disproportionation reactions the reactant is both oxidised and reduced in the same chemical reaction forming two separate compounds.